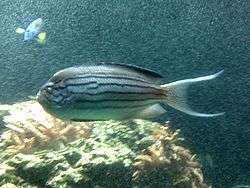 Genicanthus lamarck, commonly called Blackstriped Angelfish or Lamarck's Angelfish among various vernacular names, is a species of marine fish in the family Pomacanthidae. The Blackstriped Angelfish is widespread throughout the tropical waters of the Indo-West Pacific. It feeds on plankton along coral reefs. Sexual dimorphism occurs in the species of angelfish, the male is larger with blackish pelvic fins and a yellow spot on the front head, whereas the smaller female has brighter (white) pelvic fins. ↑ Pyle, R. & Myers, R. 2010. Genicanthus lamarck. In: IUCN 2013. IUCN Red List of Threatened Species. Version 2013.1. <www.iucnredlist.org>. Downloaded on 25 October 2013. ↑ Pyle, R., 2001. Pomacanthidae: Angelfishes. p. 3266-3286. In K.E. Carpenter and V.H. Niem (eds.) FAO species identification guide for fishery purposes. The living marine resources of the Western Central Pacific. Volume 5. Bony fishes part 3 (Menidae to Pomacentridae). Rome, FAO. Froese, Rainer and Pauly, Daniel, eds. (2008). "Genicanthus semifasciatus" in FishBase. December 2008 version.